1 Place all the ingredients for the marinade in a food processor and blitz to a smooth paste. Coat the fish and prawns in the marinade, cover and place in the fridge for 2 hours, or overnight if possible. 2 Meanwhile, make the dipping sauce. For extra depth of flavour, roast the peanuts at 180c, gas mark 4 for 5 minutes. Using a pestle and mortar, crush the peanuts into small pieces or blitz in a small food processor. Mix together with the remaining satay sauce ingredients. 3 Thread the fish and prawns onto bamboo skewers (pre-soaked in cold water for 30 minutes). Heat a griddle pan until smoking then add the skewers and cook for 3 minutes on each side until slightly charred and cooked through. 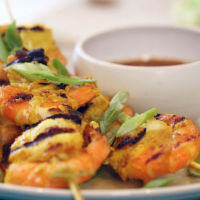 4 Sprinkle with the salad onions and serve with the satay-style sauce and lime wedges.